What happened to cause this? 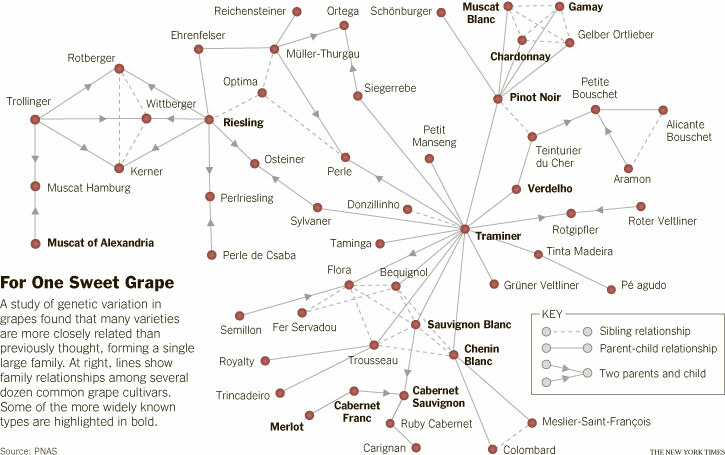 The ease of propagating vines through grafting, phylloxera, wine laws, and our palates. As a result of so much genetic similarity, the grapes are more susecptible to a wide range of pests, and vineyard managers have resorted to herbicides, fungicides and other nasty chemicals. The Times points out three options: add genes for pest resistance, go organic, breed sturdier varieties. Big problems with these three options: folks don’t like genetically modified plants, grape vines can have a hard time surviving in an organic environment, and breeding new varieties takes time, money and we’re not guaranteed a tasty result. The article went on to discuss a new plant breeding method, called genomic selection or marker-assisted breeding, which would enable scientisits to explore the grape genome.